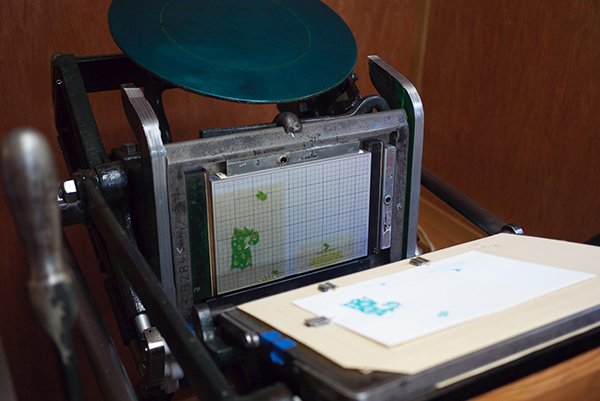 Harumi Kobayashi of Mejiro Graphics is a letterpress printer whose pan-Pacific Ocean life travels have brought her zen on press, a wealth of creativity, and a patient approach to challenges on her beloved Chandler & Price. 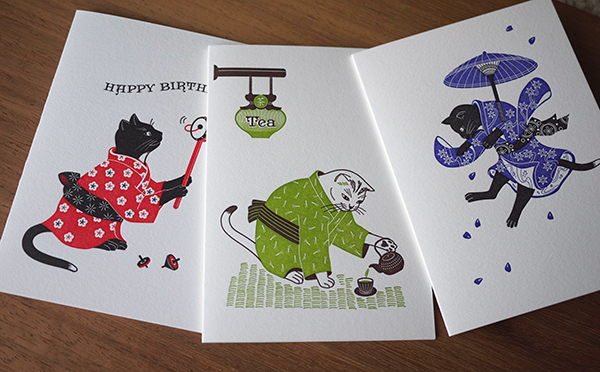 Her eye-catching, beautifully crafted letterpress work features whimsical Japanese-style artwork with bold, striking colors. 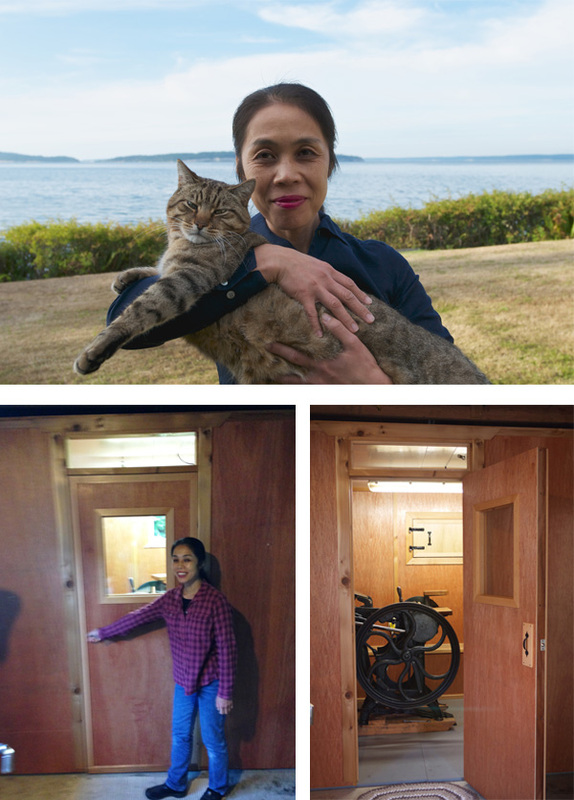 Harumi fills us in on the trek so far and what lies ahead on her printing & creative horizons. THE PRINTING ADVENTURES SO FAR I am originally from Japan and I’ve been interested in lettering and calligraphy since I was a child. 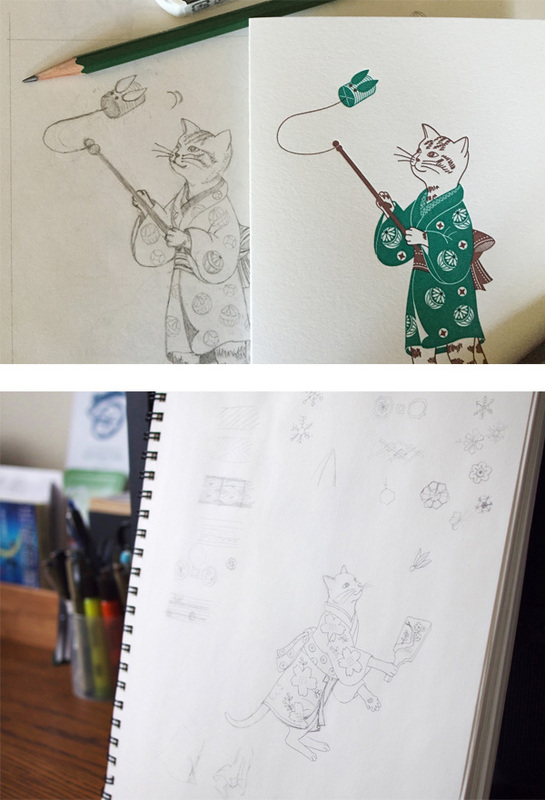 I was able to use my calligraphy experience and take a position as an assistant to a freelance book cover designer in Tokyo. After this I worked for a printing company in their graphic design department. In 2003 my husband and I moved to the US. We lived in Kauai, Hawaii and Port Ludlow, WA. When we lived in Port Ludlow, we found a two-week-old kitten in the forest and we bottle-fed and raised him. Since then Olele is a member of our family and the inspiration for my letterpress card designs. In 2016, we moved to Sherman, TX, where I work at a small commercial printing shop. FINDING CREATIVITY When we moved to the States, I established Mejiro Graphics** and I’ve been enjoying working as a graphic designer. Later I taught myself web design to broaden my services. Creating the websites was interesting, but I felt I was always trying to keep up with current trends and technologies. It was about then that my sister told me about letterpress printing. 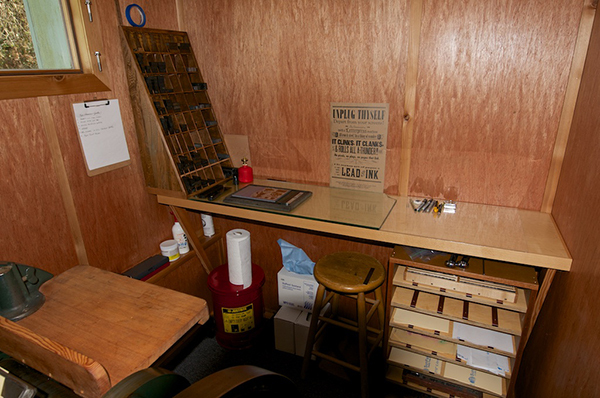 I googled letterpress and learned about people who still put value in setting lead type and printing on fine paper [and] on old printing presses. I felt I had found something that I had been looking for and was hidden inside me for a very long time. I told my husband I wanted to buy an antique printing press. He enthusiastically supported me and helped me find a press and he built me a printing shop. **A Mejiro [may-gee-row], or Japanese White-eye, is a small olive-green songbird with a conspicuous white eye-ring. SEASIDE ENDEAVORS We moved to Port Ludlow, WA so my husband could attend a wooden-boat-building school, and we were very lucky to rent a house on Puget Sound. So my husband built his shop and my printing shop in the 2-car garage, and we each had an ocean view. It was very quiet and peaceful. We heated our shops with wood we harvested from the forest and felt quite self-sufficient. PRINTING MENTORS I was delighted to get to know Ellie Mathews and Carl Youngmann at the North Press in Port Townsend, WA. Ellie taught me how to set type and Carl always gave us good advice and solutions when we had problems about printing. Through them we met many local letterpress printers and bookbinders. Their work and their enthusiasm for printing inspired me a lot. DESIGNED FOR PRINT I’m a designer and a printer. I enjoy exploring and sketching the ideas for our greeting cards. My husband and I evaluate the designs and re-sketch many times. When we’re satisfied with the design, I scan the sketch, create a digital file in Adobe Illustrator, and fine-tune the design. I order the polymer plates at the Boxcar Press. When I receive the plates, I mount it on a Base, hand-mix the ink and print it. As all you know, the press doesn’t work the same way every time and we are sometimes frustrated. But usually one of us has patience and comes up with an idea to fix the problem. We put our hearts into the process and we’re always happy and content when we see the finished card. It’s delightful to see the colors come alive when printing on fine paper and for the image to take on the depth that letterpress printing gives. PRINTING FEATS I’m proud that my husband restored our press completely. In addition, when we realized how important it was for the rails to be flat and of even height after a lot of trial and error printing, he began to think of ways to build up the rails. He wasn’t satisfied with the multiple layers of tape to make up for the heavily worn uneven rails so he disassembled the press again and using a metal and epoxy mixture, renewed the rails to almost new condition. Then we moved on to inking and other challenging printing issues. 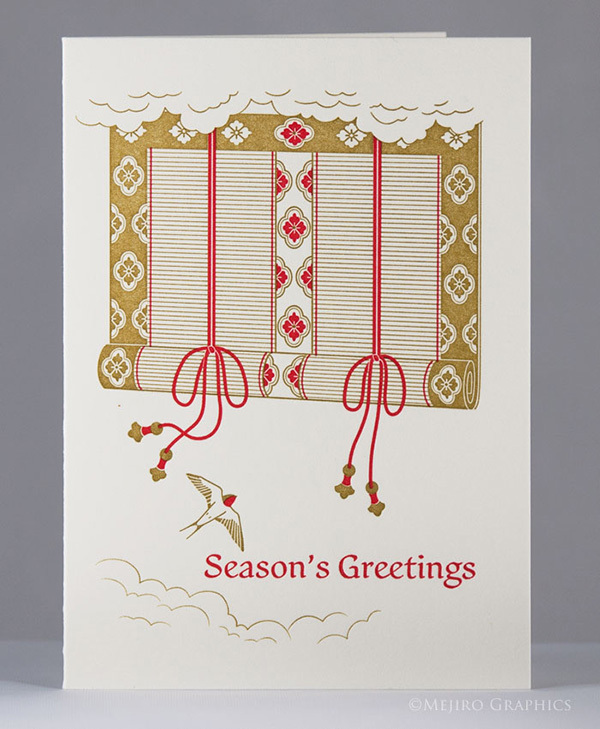 I’m happy that we worked together and continued to enjoy the challenge of printing our original greeting cards. PRESS HISTORY We found our first press in Portland, OR. We brought it home covered in tarps in a rainstorm, of course. It is an old-style 1890, 8×12 Chandler & Price. It is our first and only press for now. We think it is beautiful. BOXCAR’S ROLE When we bought our press, we didn’t know anything about printing and polymer plates, and we didn’t know anybody to ask. When we called Boxcar Press, they were always happy to help us and gave us information and suggestions. SHOP TIPS I have two Boxcar Bases of the same size. For two-color printing, I put each plate on a Base and test print without inking to adjust registration and packing. This way I can see where to add packing easily and it helps avoid the ink drying out on the plates because we use and prefer oil based ink. WHAT’S NEXT When we moved to Texas, unfortunately we needed to put our press in storage. We don’t have a lot of extra money at the moment so we’re looking for a free or low-cost place to set up our shop. I have several new card designs and hope we’ll be able to print them in early 2018. 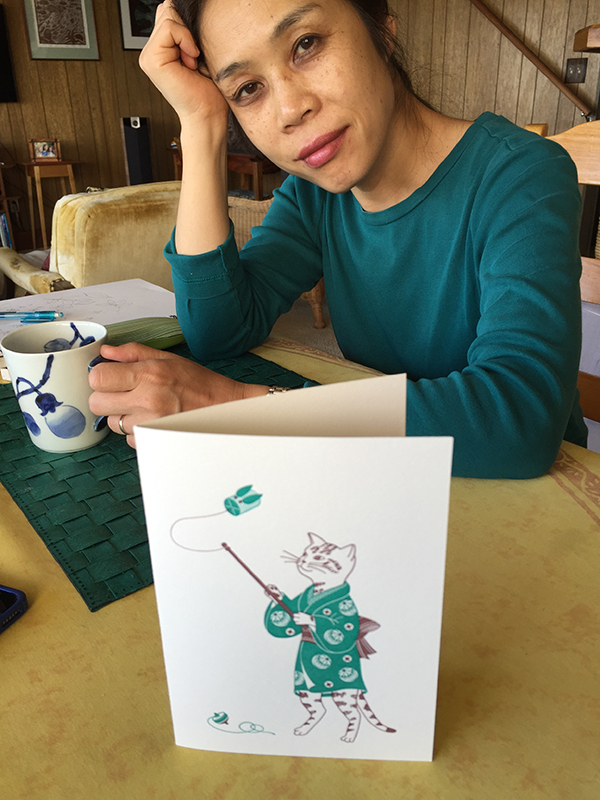 A huge round of thanks out to Harumi Kobayashi of Mejiro Graphics (Etsy store) as we’re eager to see what she comes up in the not-too-distant future. 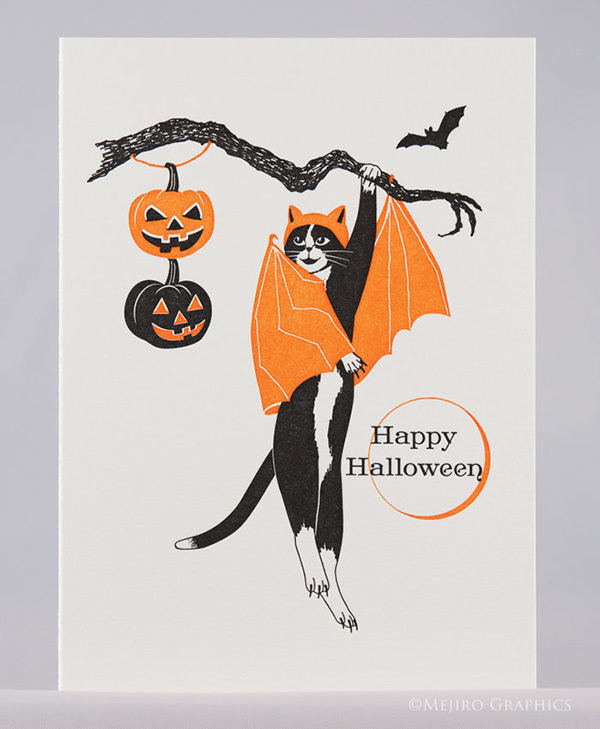 This entry was posted in Printer Profiles, Shop Talk and tagged C&P, Chandler & Price Old Style, Harumi Kobayashi, Letterpress Is Fun, letterpress printer, Mejiro Graphics, printer profile, printers, Washington by Rebecca Miller. Bookmark the permalink.